I love heights, I always have and even as a kid, if it meant climbing up to the swaying tree top for a good view, I would do it. So on a recent visit to Langkawi the first place I headed too upon arrival was to the Cable car. It is located on the south-western coast of the main island of Langkawi and is just a 30 minutes drive from Kuah town or 15 minutes drive from the Langkawi Airport. 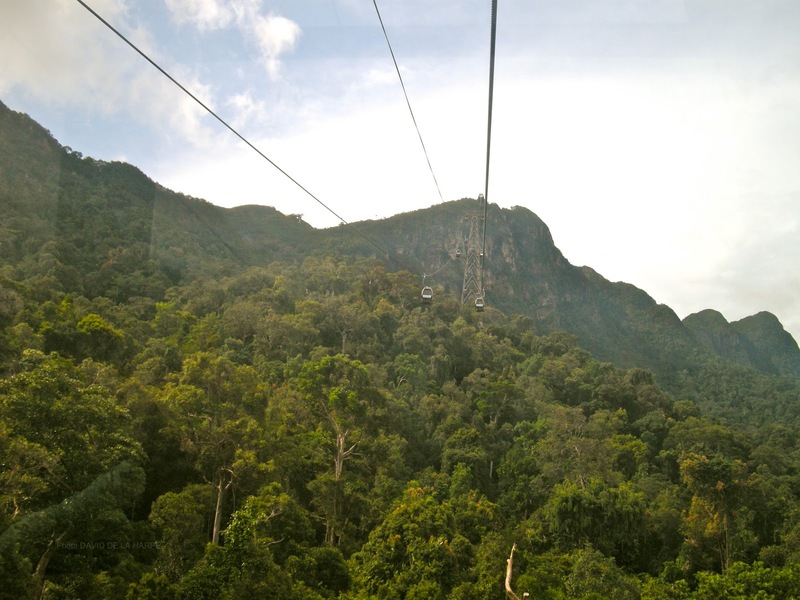 The Cable care system is actually a combination of the cable car ride, various platforms or stations and the spectacular Sky Bridge, all built on the Machincang mountain range. Located at the Oriental Village which in itself is an attraction, as it’s a theme shopping centre housed in 30’s individually designed buildings showcasing Malaysian and Oriental architecture. The total length of the cable car ride is 2079 meters, takes about 15 minutes each way and was completed in 2002. Base station - It is here that visitors purchase their entrance tickets and board the gondolas for the ride on the cable car. As you step into the gondola and its starts it climb, you are overcome with an incredible feeling almost like flying, as the gondolas start their smooth and graceful ascent towards the Middle station. Views of the green rainforest and steep mountain ridges zoom up to meet you. Looking down, your eyes are caught by the beauty of the Telaga Tujuh or seven wells water fall and on the horizon, the many enchanted islands of Langkawi, and float like jade pebbles in a blue ocean. Occasionally a white bellied sea eagle will fly across your path of vision reminding you that you’re in their airspace. Middle station – Sitting at an elevation of 650m above sea level the distance from the base to the middle station is 1,700metere in length. Visitors get off here and walk up to the viewing platforms which give access to the eastern cliff of the Machincang range. Here you are able to enjoy the 360-degree views of the main island and surrounding islands and also observe at close range the unique rock formations of the Machincang range that was formed 500 million years ago during the Cambrian period, in geological terms. After enjoying the beautiful view, visitors then re-board the gondolas for the final 450 meters to the top station. view from inside a gondola. islands, Kedah and Southern Thailand (try to make it up in time for the sunset). There is a cafe at the Top Station offering refreshments with unbeatable views and at 708m above sea-level; the temperature is about 5 degrees cooler than lowlands. Another incredible attraction here is the SkyBridge which was completed in 2004; this suspended bridge is built on top of Mt. Machinchang and is accessible from the Top Station. Measuring 125m in length, the structure ranks among the world’s longest curved suspension bridge and constructing it was not an easy feat as many solutions had to be found for the construction challenges. The entire bridge, in all its elements had to be lifted to the top of the mountain by helicopter and was later assembled to its current position. The bridge is suspended from an 82m high single pylon and hangs at about 100m above ground. It swings out over the landscape to give visitors a very unique experience, and to bring them into otherwise unattainable locations, above virgin jungle with spectacular views.